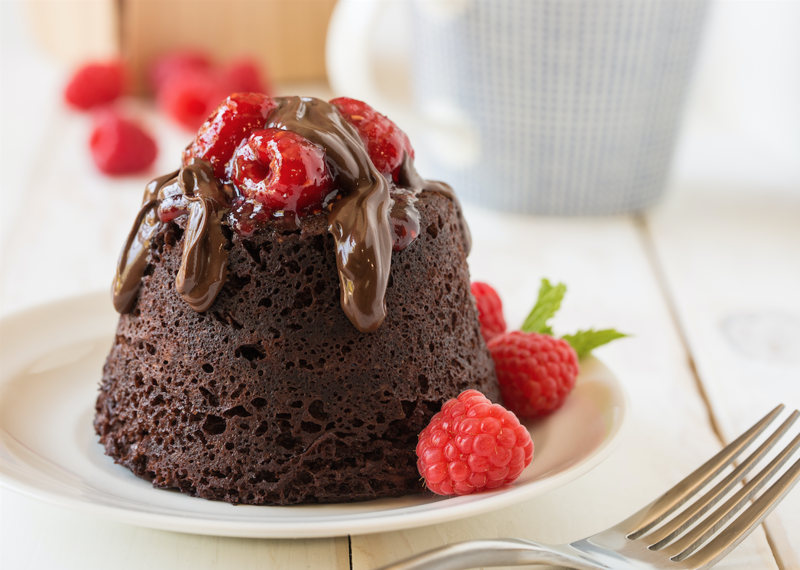 Mug cakes are all the rage in the baking aisle, and the funny thing is you don’t need to purchase a packaged mug cake mix, you can actually make your own with ingredients you likely already have on hand! 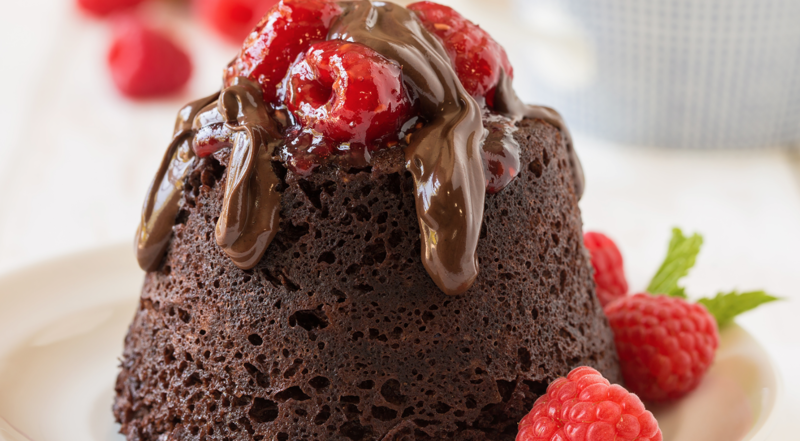 Using simple ingredients, you can make a delicious chocolate cake in a mug in the microwave in a matter of minutes. No need to heat the whole house with the oven on, you can prepare this recipe using just a bowl and a mug. It’s so delicious. I made one last night using this recipe and it was to die for! I used Bob’s Red Mill Almond Flour and it gives the cake just a hint of almond flavor. You’ll love it! 1. In a small bowl, whisk egg for 1 minute with a fork. Add yogurt, maple syrup and cocoa powder, stirring until smooth and all the cocoa powder has been absorbed. 2. Add in flour (either almond flour or whole wheat) and baking powder, and stir just until mixed. Fold in 2 teaspoons raspberry preserves. Pour mixture into a large mug sprayed with nonstick spray. Sprinkle in 2 teaspoons of dark chocolate chips. Microwave on high for 1 minute. 3. Remove and let cake cool for 30 seconds. Carefully turn it out onto a plate, and top cake with raspberries, then a little dollop of raspberry preserves (it will melt and run down the cake). Microwave the last teaspoon of dark chocolate chips just until melted, then pour over the top of raspberries. Enjoy immediately! 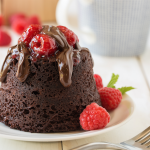 A perfect dessert for one, this chocolate mug cake recipe is made with Greek yogurt so you can indulge and not feel guilty! SuperSafeway is a blog devoted to helping you find the best deals at Safeway in the Denver division. Every week we find and share the best advertised and unadvertised deals at Safeway with and without coupons. We also share recipes and weekly meal planning ideas based on sales to maximize your savings. For more low prices, check out Super Safeway’s weekly ad coupon matchup page. Stay updated on the best deals by following Super Safeway on Facebook, on Twitter, on Instagram, or Pinterest and subscribe to our newsletter. Thanks to Safeway for letting us share this image and recipe with you. * Please note – Savings information is based on Colorado pricing and the Safeway Coupon Policy for the Denver Division which includes Colorado, Nebraska, New Mexico, Wyoming and South Dakota. Your market may vary.